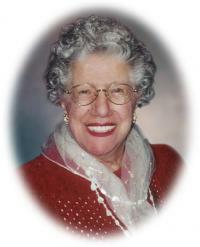 On March 1, 2012, Dora Armstrong of Edmonton passed away peacefully at the age of 99 years. Dora is survived by son Edward (Marnie) of Edmonton, AB, and daughter Bernice (Richard) Hall of Littleton, Colorado; five grandchildren and four great grandchildren; her sister Edna Drake of Edmonton; and loving nieces and nephews. She was predeceased by her husband Robert and sister Adele. Thanks to her loving cousin and caregiver Denise Morie for making her last years so special. Cremation has taken place and a Memorial Service will be held on Thursday, March 8, 2012, at 2:00 pm at Holy Trinity Anglican Church, 10037-84 Avenue, Edmonton. In lieu of other tributes, donations may be made to the Holy Trinity Church Arts Fund.